He presses his hands against the hard plastic arm rests of his chair and sluggishly walks towards me, looking me up and down, judging my strength, my will, and my ambition. He shakes his head. Reluctantly, I weigh my options. 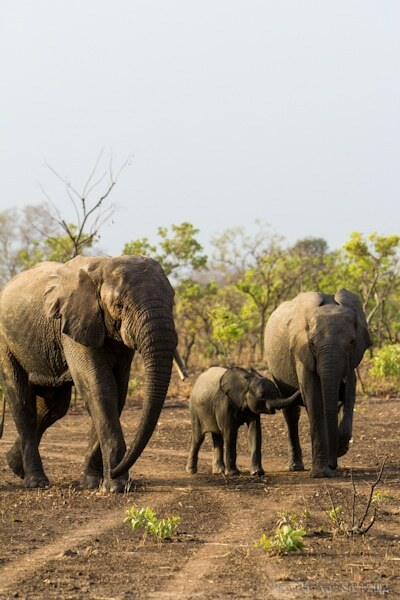 On one hand, the idea of seeing the elephants of Ranch de Nazinga, Burkina Faso‘s premier wildlife viewing park, from the backs of my scooter would make for an amazing experience, and a great story. However, I’ve never seen elephants in the wild before. I don’t know how they behave, I don’t know how they react, and I don’t know how to escape their charge. It’s the dilemma I so often face, the risk of personal harm versus the reward of a great story. Unlike most times, I choose the safe route on this occasion. I toss my bag into the backseat of a land cruiser and we bump our way through the sandy roads of Nazinga. We’re surrounded by scrub, tall grass, and a sense of adventure that I can’t shake. As we drive, the chauffeur points to various waterholes and clearings while mentioning constantly how the elephants were there just a few hours ago; right now they’re nowhere to be found. We arrive at the Ranch and I once again have come up empty in my goal of seeing elephants in the wild. Twenty minutes later a group of French tourists roll in all laughing and brimming with excitement. Just down the road, they say, they saw a group of seven elephants. I missed them by that much. Following an assault in which I’m attacked by the sight of a half dozen LCD screens laden with pictures of elephants shot at fairly close distance as the French tourists brag and gloat, I head to bed hoping not to get shut out again tomorrow. The wildlife lover in me has been dying to see elephants from the moment I arrived in Africa, more so than lions even, but the competitor in me can’t deal with all these failed runs. Especially if the French are seeing them. The morning starts out calm. The cold winter desert air somehow adds to the excitement. 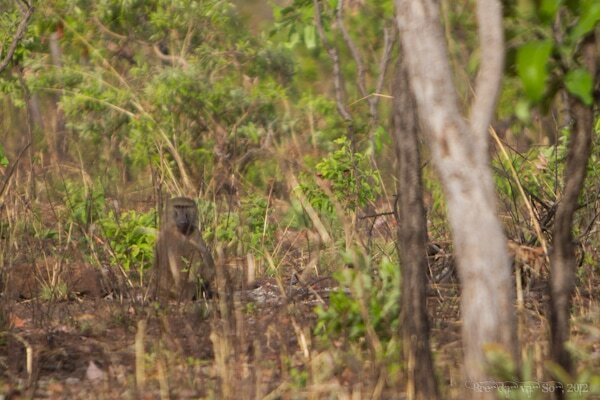 We stop constantly as the guide points off in the distance at antelopes, warthogs, baboons, and birds. After about a dozen or so stops I look back at my guide and tell him that we’re not going to stop for antelopes anymore until we see elephants. He laughs, and points ahead. In the distance, like grey stones standing in the desert, I see the backs of what I’m told are elephants. Soon, a tossing of orange dust in the air makes it clear. We pull the land cruiser within a safe distance from the world’s largest land mammals. There are few things more humbling than standing meters from these great animals. Unlike many of my other experiences, I don’t race to get as many photos as I can. Instead, I sit on the sill of the vehicle’s window and enjoy the moment, breathe it in, experience it. The family of elephants approaching us. The family is made up of a giant bull who is missing one of his tusks. He stands in the distance among trees as if he’s hiding himself. The protective mother stands proud alongside a couple of her young offspring as well as her fairly newborn calf. It’s the calf that draws my interest. The young elephant seems to smile as it races around following the leaders of the herd. It dances in the dusty air as the rest of the family stares in protection. It’s a moment of peace. An instant in which the connection between human and wild seems so strong, but the tension so thin. The bull elephant that charged us. With a trumpet and a showing of the ears, the big bull decides he’s had enough of our presence and begins to chase us. The driver hits the gas pedal with emphasis and as I slide back into the vehicle everyone is laughing. I’m sure that had I been on the scooter it wouldn’t have been nearly as funny. The elephant chased us a good 200 meters through thick sand before relenting. Did you catch any of the action on your GO Pro? What did you do with your scooter? Yeah dude, that stuff is coming up soon. I left the scooter at a hotel just outside the park boundaries. Thoroughly enjoying your trip thru the wild kingdom and kudos for getting the good shots, your way. This is awesome! 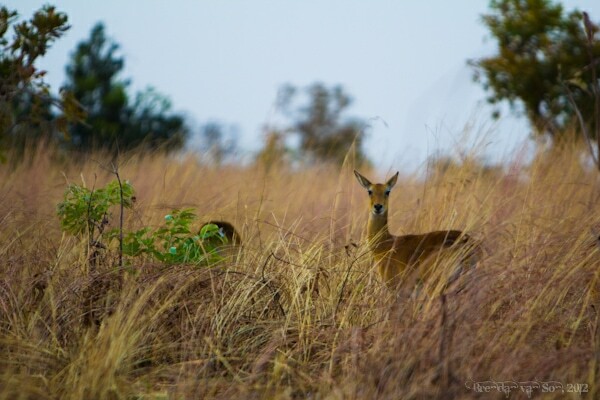 I’ll be in the region later this year, and was considering doing a safari in Burkina Faso. Not sure if I’ll do one there, or in Ghana’s Mole National Park, but either way, I aim to see me some elephants, too. Wise decision not choosing the scooter, by the way. Also, I know what you mean about baby elephants – they always look so happy! Thanks Tom – I just did Mole this week and it was awesome. You can get seriously close to some wild elephants there!!! Don’t expect massive herds, but one or two are basically a guarantee. What an amazing experience! Like many others, I have seen elephants at zoos, but I can only imagine the absolute thrill that coursed through you when you saw them in the wild. I should imagine it is something like what I feel whenever I dive and find myself surrounded by fish – they are so close and without any boundaries around you, utterly unpredictable. There is really something completely exhilarating about getting up close & personal with nature! Exactly Steph, good example with the fish! It’s such a more powerful experience when there is no division between you and them. 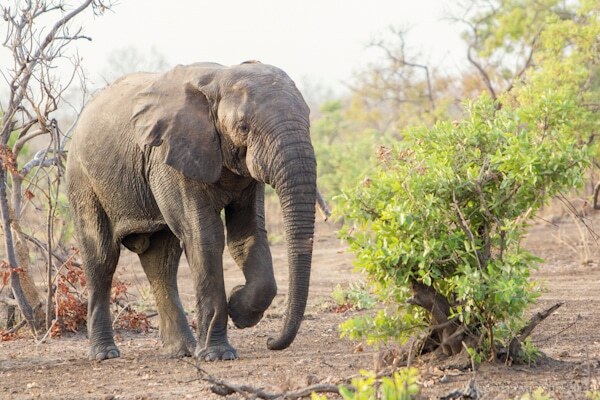 Tammy – Being charged at by a bull elephant actually is really fun… as long as you can get away haha. What kind of moto are you traveling on? I recently trained as a mahout for 3 days in the northern mountains of Thailand and was sitting on Arranyuh’s neck when the guy who was training me showed me how much traction elephants actually have. The next 20 minutes were spent literally scaling a 45 degree (and some times more steep) hillside in the dense jungle. They do not “slip” and can go 20+ mph when they want to. Such amazing animals. I’m pretty sure you made the right decision not to go on your scooter! Great creatures and cool story. I wonder if the Elephants in western Africa are the same as Eastern Africa? I’ve been lucky to see elephants in a few places, including the Asian Pygmy Elephant in Borneo (so cool!) Would lvoe to get to this part of Africa one day….keep up the great posts! Yes and no mate. There are two types of African Elephants the Savannah Elephants and the Forest Elephants. In west Africa in the jungle you get the forest elephants. 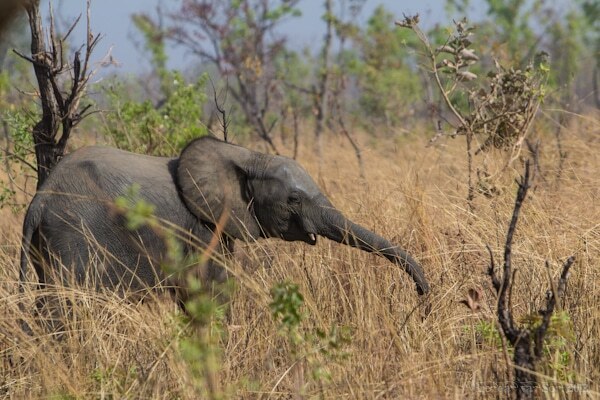 In places like Burkina you get Savannah elephants which are essentially the same as the elephants in eastern Africa. The forest elephants are smaller and about a million times harder to find as I’ve found out on my 3 treks to try and find them. One more question, we have our own land cruisers and we plan to take them to the park. Do we still have to hire drivers, or would one guide suffice? You’ll be fine just showing up at the park, there’s never a problem with that. Also, you wont need to hire a driver for your land cruisers, just a guide and you’re ok. Truth is too that the prices are very reasonable for the guides. Just came across your video on YouTube and it made me home sick. My brother and I started Nazinga back in 1976 and left in 1990. Good to see some of the buildings we built and the wildlife I loved. Wow, amazing to hear that you are one of the founders! It’s still going strong to date. There were loads of elephants, and other animals. One of my favourite spots in Africa! You did a great thing there. Like Rob, I just came across your video and that stirred up some memories. As a student I stayed at Nazinga for about 3 months back in april, 86. The concrete guest houses were just build then. I see a lot of things I can remember (like the dead tree stump in the middle of the lake) but also a lot of new stuff. I remember one day I was out in the field, when I heard the sound of a tree falling, followed by what turned out to be a stampeding herd of elephants. One of them must have been rubbing against it and pushed it over. I always imagined this falling tree almost hitting another elephant, frightening it – resulting in the a running herd. Anyway, this herd of some 10 elephants ran past me at some 40-50 meters. Was one of the scariest and also one of the most exciting experiences in my life.